Doctor Who is neither as family friendly nor crowd pleasing as it once was, and there's no escaping the below average ratings, but does that stop Steven Moffat from still going all out and giving us one of the strangest, most dizzyingly unique Doctor Who stories in the show's lengthy history? No, Sir, it does not. And quite right too. "Extremis" is entirely unpredictable. Well, saying that, the episode reveals to us that it is indeed Missy (Michelle Gomez, as delightful as ever) inside the Vault that's been popping up every episode thus far - it's hardly a revelation no one saw coming. Yet, "Extremis" does well to sidestep the reveal's obviousness in favour of even more intrigue. We know now that it is Missy in the vault, locked there when the Doctor (Peter Capaldi, as commanding as ever) refused to execute her hundreds of years ago. He has promised to guard her nonetheless, but why was she being executed? 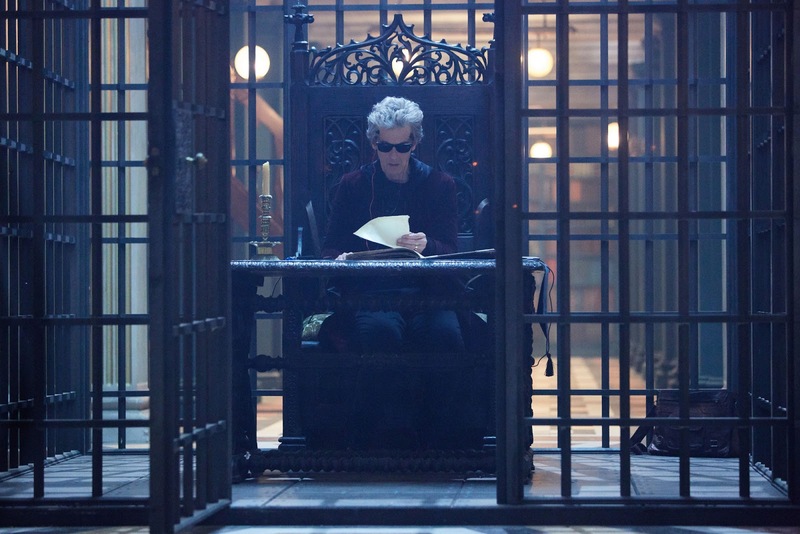 Why has the Doctor still guarded her in the vault? The mystery is answered, but fresh layers take its place. This is only one portion of the episode though, unfolding through flashback. The present timeline - or so we think - finds the Doctor approached by the Pope. An ancient text called the Veritas has been uncovered, and every person who has ever translated it has ultimately taken their own life. After picking up Bill (Pearl Mackie, as enjoyable as ever), the Doctor and Nardole take the TARDIS to the Vatican to work out what the hell is going on with this Veritas. Once there, they uncover a sinister group of monk-like aliens who want to take over the world. Much like you'd expect from the genius mind of Moffat, though, this is no ordinary invasion. In fact, this isn't even an ordinary world. After some rare brilliant VFX work that sees Nardole pixelate and fade away into nothingness, the Doctor reveals the truth to Bill - this isn't our world, it's a virtual reality. A hologram, if you will. This alien species is so clever that they create entirely realistic fake versions of their target worlds in order to practice their invasion, to get a sense of the response so that they can strategise the best plan to invade with. It's a head-spinning concept, and the twist lands brilliantly. It's unfolded slowly, with Bill and Nardole getting all the relevant information first but unable to piece it all together. That job belongs to the Doctor, and Capaldi relishes every moment. His conversation with Bill in the episode's climax is terrifying in how scared and sinister the Doctor appears, yet Capaldi is forced to ground his performance in vulnerability. The Doctor is still blind, remember. He's facing the most intelligent invasion he's ever seen, and he can't even see it. It sounds like heavy stuff, and it is, but Moffat's script knows when to lighten the tone a bit - morbid Doctor Who is unpleasant Doctor who, save for the phenomenal "Heaven Sent". An early sequence of the Pope wandering into Bill's bedroom is brilliantly funny, and Bill and Nardole's lovable chemistry further adds a bit of lightheartedness to an otherwise dark episode. Moffat demonstrates a remarkable control of tone here, and it's vital to some of the episode's more risky subject matter - a Religious group are key players in the episode, but "Extremis" doesn't dismiss them or laugh at the them within the Sci-Fi. Director Daniel Nettheim brings even more to the episode's impact. Doctor Who is renowned for its long corridors, but they've never looked creepier than the ones Nettheim conjures up inside the Vatican's secret library. The projection room oozes influence from 2001: A Space Odyssey and the effect is fantastically disorientating, it truly looks and feels alien - something Doctor Who can frequently struggle with on a BBC budget. In other words, everything about "Extremis" is first rate. This is Moffat's second script of the series, but due to the nature of "The Pilot" this feels like the first time he's been able to let loose and get weird. The first five episodes found the show on good form, but it rarely left its own self imposed boundaries. "Extremis" doesn't just step over those boundaries, it sprints past them - never looking back and grinning as it goes. Seriously, that moment of the Pope in Bill's flat is the hardest I've laughed at this show in ages. The Doctor returning to the real world and immediately telling Bill to phone Penny was a nice touch. Even amid all the crazy plot twists, Moffat finds some heart inside the episode. Those monk creatures are scary as hell. I don't know whose idea it was to have their mouths open but only move slightly when they speak, but they're an evil genius. It's so great to have Michelle Gomez back. She doesn't get a tonne of screen time here, but boy does she make the most of it. She's such an infectious presence in this show, I'll miss her a lot come the new era. Next week sees the middle episode of this three parter. Considering it's written by Peter Harness, the man who helmed the exceptional "Kill the Moon" and the breathtaking "The Zygon Inversion", I'm considerably excited.